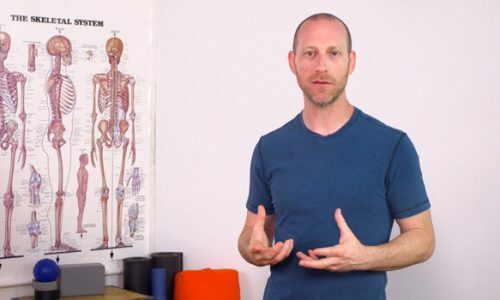 Think you know what your SI joint is doing in your yoga practice? Think again. You can use the links above to navigate to the topic you’re most interested in. But first, let’s set some context for our understanding of the SI joint and its relationship to what we might experience in yoga asana. 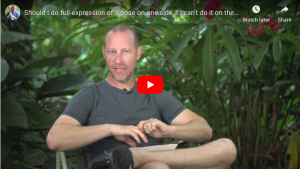 There is an ongoing discussion in the yoga community about how much the SI joint moves, the way it moves, and specifically whether or not trying to direct movement from the SI joint will improve your backbends. You can read a summary of the discussion and comments in my previous article: Nutation Counternutation. I start by sharing the context for understanding the SI joint below, because I am frequently asked to weigh in on the discussion about the SI joint in the yoga community and asked to comment on others’ opinions of how the SI joint moves, doesn’t move, etc. While I will share my own understanding and opinions on this complex joint, please don’t ask me to explain other people’s opinions as part of this discussion. It’s not my place to comment on others’ opinions. NO ONE knows exactly what the SI joint is doing when you’re in a backbend, including the researchers that have studied SI joint movement in as in-depth way as possible with the technology that is currently available. We have done a copious amount of digging into the research that exists out there on SI joint movement and as far as we have seen, no one has ever looked at SI joint movements going into, being in, or coming out of a backbend. If you know of RESEARCH that measured this, please let us know. The SI joint moves approximately 3mm on average. That’s about the distance between these two pipe symbols | | or 1/8 of an inch. The SI joint is a passive joint, meaning it is moved or affected based on body position. There are no muscles that are shown to directly move it. That doesn’t mean that changing muscle tension doesn’t affect it. But, it’s definitely not like contracting the biceps and moving the elbow. Anyone, including me, who suggests that they KNOW what is happening at the SI joint in any type of backbend is making an educated guess. It is not a statement of fact. The basic descriptions of sacral movement make it seem like the sacrum pivots, nods, or tilts forward and backward. Although that is not completely false, it is far from the ridiculously complex nature of the movement at this joint. Most people do not feel their SI joint specifically move while doing yoga, however, those that are hypermobile are more likely to feel it. You might create space or something that feels good in your body, which is fine, but that doesn’t mean it’s your SI joint alone. This joint needs stability, hence the large number of ligamentous structures surrounding it, preventing us from moving it too much. 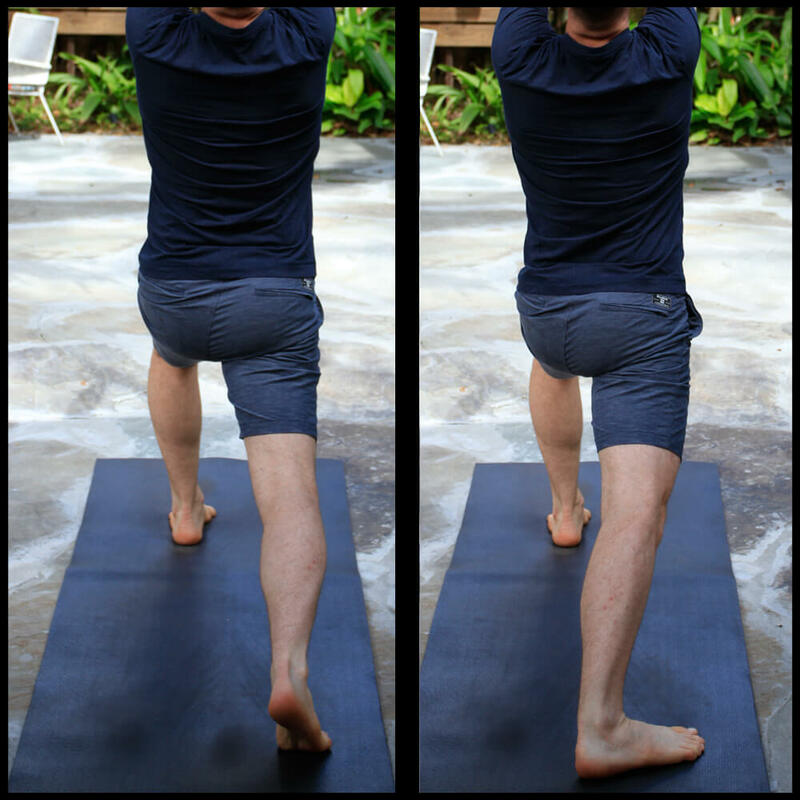 Most of what we KNOW about the SI joint, and therefore, most of the discussion in the yoga community about the SI joint (what to do with it, and what not to do with it) is not based on data that has measured what the SI joint does IN YOGA POSTURES. My last 20 years of teaching, combined with my understanding of anatomy, lead me to say there is never a time that I would want to purposely direct pressure into the SI joint. I don’t think those multiple dense ligaments at the SI joint are an accident. What people are often suggesting is to put the joint into what is sometimes called a closed pack position, which is basically nutation of the sacrum. I do not see anything inherently wrong with this anatomically. It is a more secure and stable position for the SI joint. However, I remain unsure that this is even possible when the body is in a position such as urdhva dhanurasana (backbend) or other postures such as kapotasana (Ashtanga version, deep backbend on the knees). This is mostly due to the depth of hyperextension of the hip joints when in such deep backbends (my opinion). Even if you could choose to move the SI joint, I definitely don’t think moving a joint that only moves 3mm on average is the “magic” that makes a backbend work. That’s not to say that anecdotal information and experience isn’t valuable, it is. We should use it and you should use it in your practice based on YOUR experience. I do believe that we have done enough yoga and worked with enough students to be aware of situations in yoga where we are most likely putting additional pressure into the SI joints. We should be careful in those places. Now, onward to exploring the SI joint! 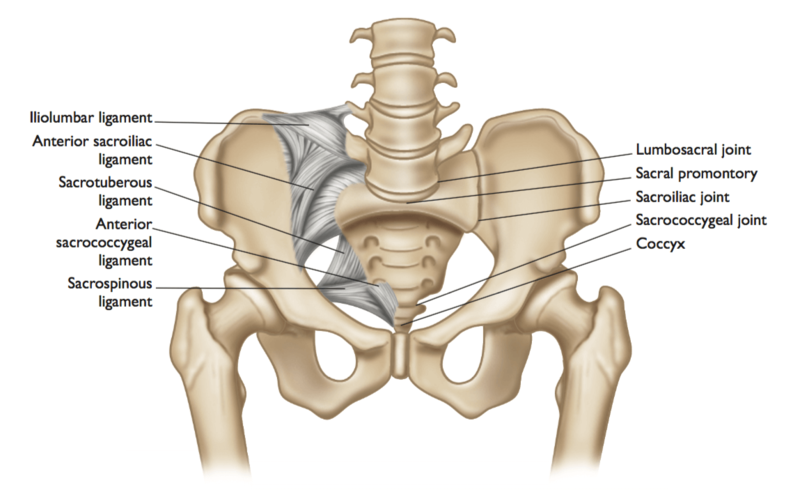 What does the name sacroiliac joint mean? “Sacro” refers to the sacrum. The sacrum is the triangular bone at the base of the spine. The sacrum is located below the lumbar spine and just above the coccyx (the tailbone). “Iliac” refers to the ilium, one of the three bones that make up the pelvis. 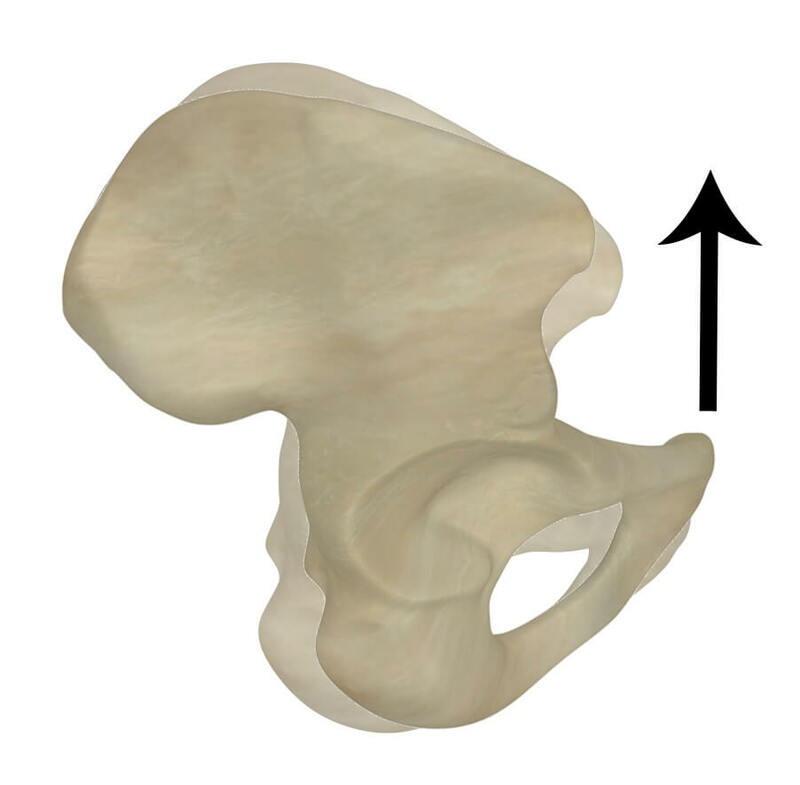 The ilium is the large, flat, upper section of the pelvis. It’s the section shaped a bit like an “elephant ear”. What and where are the SI joints? The sacroiliac joint, often abbreviated as SI joint, is the joint formed where the boomerang shaped sides of the sacrum meet the similarly shaped parts of the ilium on the back (dorsal side) of the pelvis. We have two SI joints, one on each side of the pelvis where the ilium and sacrum come together. The SI joints are where the two sides of the pelvis connect to the spine. Structurally, the SI joints are synovial joints. The joint surfaces have hyaline cartilage and they are bathed in synovial fluid within the joint capsule. This is the structure that allows for movement at joints. However, functionally, the SI joints don’t move very much. The SI joints are known as plane or gliding joints. Their shape allows them to move only by gliding or moving in the plane in which they are located. This means that, while they can move, the amount of movement is very limited. Movement at these joints is limited by their shape and the dense ligaments holding them tightly in place. Although we all have two SI joints, the anatomy and movement of the SI joints is highly variable from individual to individual (see Vleeming et al., 2012). 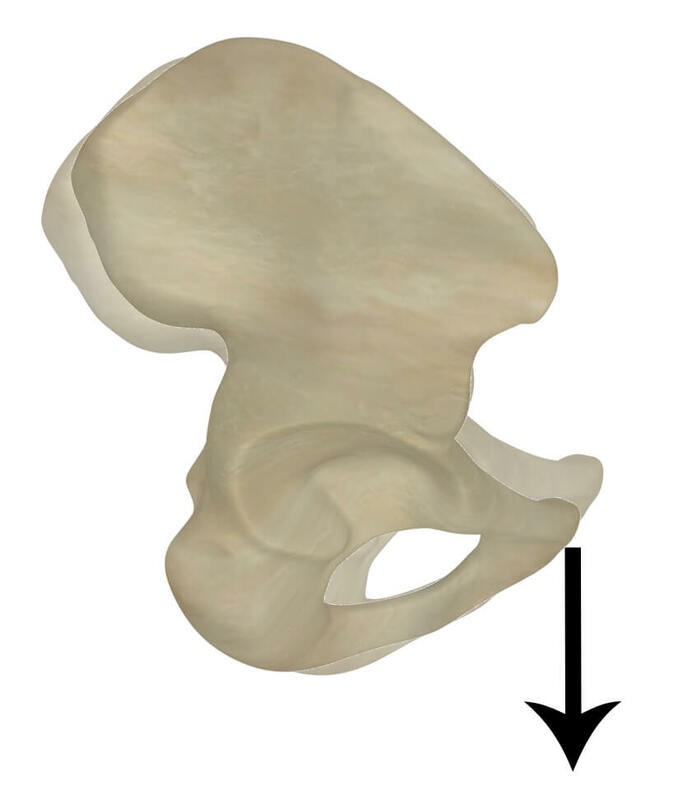 Anatomy and movement of the SI joint is affected by gender, time of menstrual cycle in women, stage of pregnancy in women, and other factors. Our individual SI joints also change as we age. The SI joint is essentially the place where our upright posture is maintained. Four-legged animals also have a sacroiliac joint. They also have a vertical pelvis. However, their spine is horizontal. If we were going to make a four-legged animal go upright, we would essentially rotate them at their sacroiliac joint. What structures affect and/or cross the SI joints? No muscles attach directly from sacrum to ilium. However, the piriformis muscle does attach from the sacrum to the femur (specifically on the greater trochanter). In the case of the SI joint, there are multiple strong, dense ligaments that connect the bones to create this joint. The presence of these ligaments around the SI joint is particularly important, as considerable force can be directed into this joint from multiple directions. It points out that the joint is not fixed, but does require a considerable amount of support. As I described at the beginning of this post, the structure of the SI joints suggests that, while some movement is possible, the amount of movement is very limited. The dense, strong ligaments connecting these joints don’t allow for the same kind of elasticity as muscle tissue. The shape of the joint also limits movement. Current research suggests that, on average, movement of about 2 degrees is possible in each direction where movement is possible for these joints (Vleeming et al., 2012). If there are no muscles directly connecting the sacrum to the ilium, then how does the SI joint move? 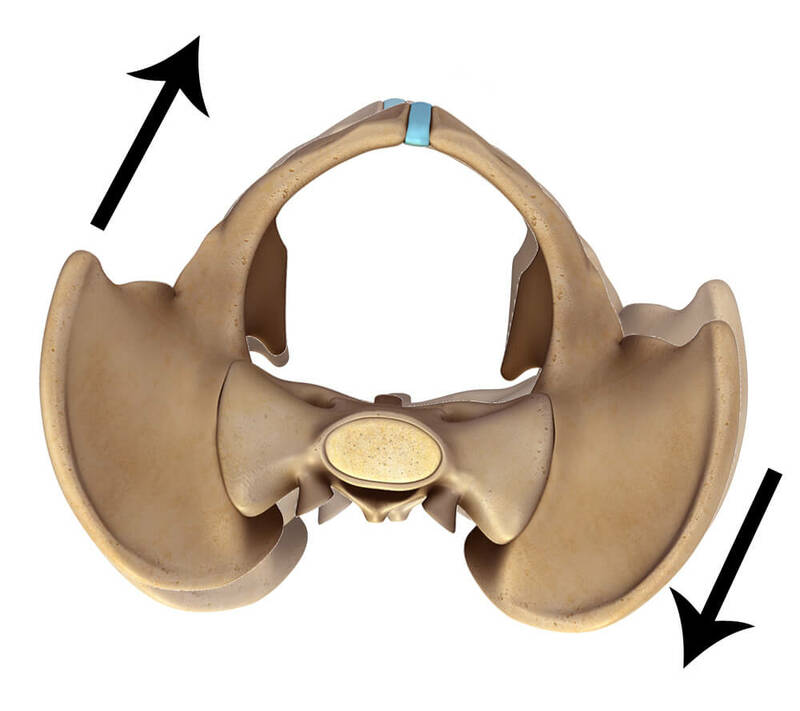 The SI joint moves through passive movement. 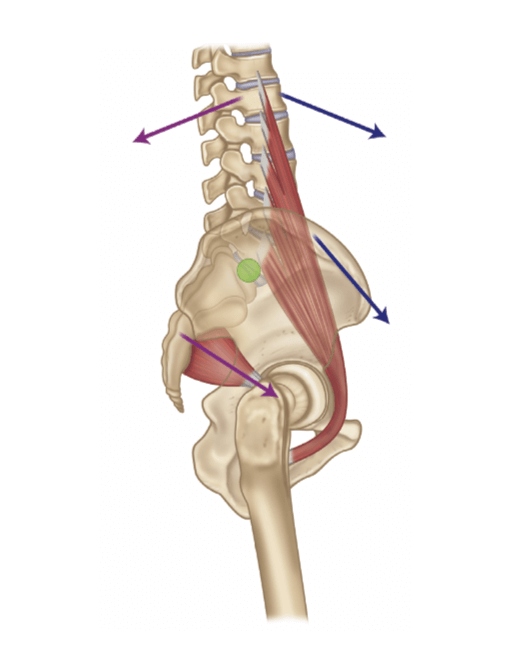 Force is directed into the joint from movement at other joints above or below the SI joints in the kinetic chain. Force is also directed into the joint merely from the weight of the body in gravity. There are complex angles created at the SI joint, making it difficult to study exactly what happens during movement at the SI joint. Notice the Complex Angles Created at the SI Joint Where the Sacrum Meets the Ilium (view from above). Male SI closer to parallel, female pelvis at a stronger angle. 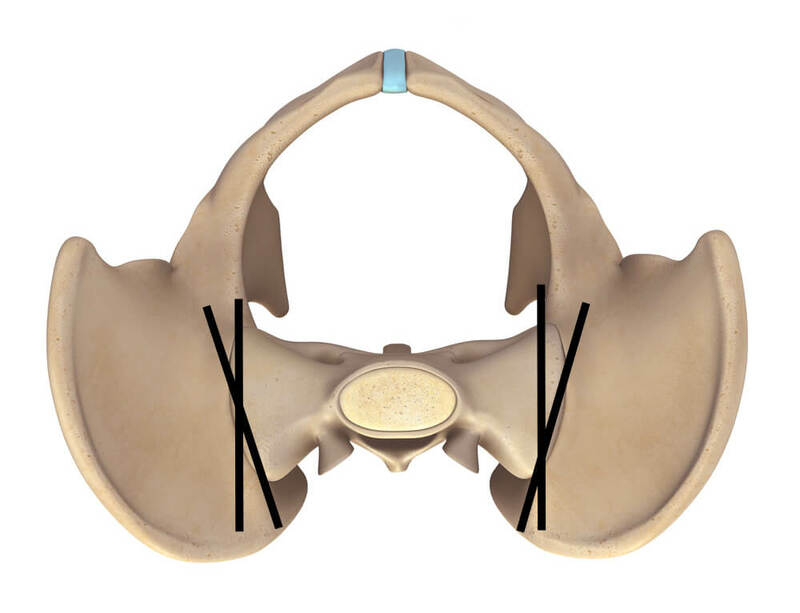 Notice the Vertical Angle Created at the SI Joint Where the Sacrum Meets the Ilium (posterior view). Movement at the SI joints is called nutation and counter-nutation. 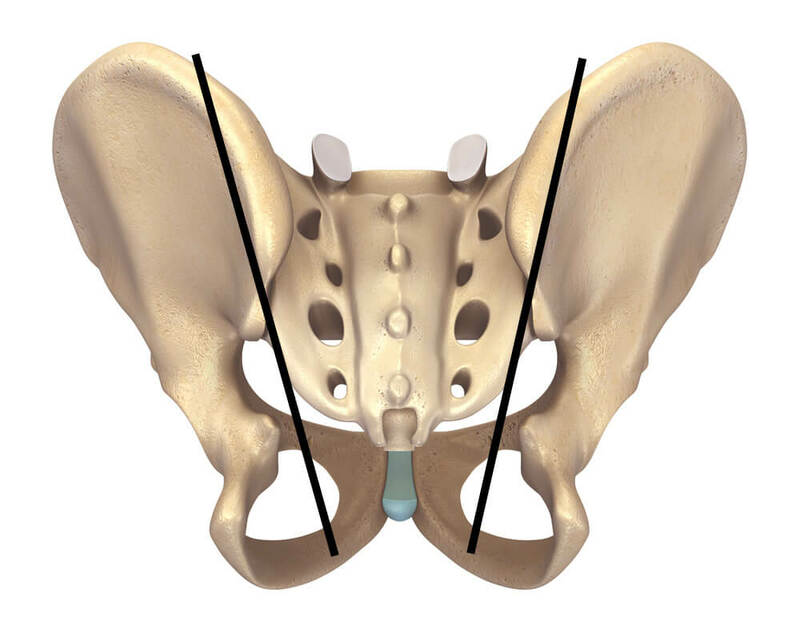 Remember that movement at the SI joints describes the relationship of the sacrum to the pelvis. This is a separate movement from movement of the pelvis at the hip joints. We’re describing movement at the SI joints when the pelvis is fixed and the spine, and therefore sacrum, is moving. We’re also describing movement at the SI joints when the sacrum stays in place and the pelvis is moving. This can get confusing when you leave anatomical position and are upside down or backbending! Nutation occurs when the top of the sacrum moves down and forward (anterior and inferior) in relationship to the two sides of the pelvis. Counter-nutation happens when the top of the sacrum moves back and down (posterior and inferior). In forward bending there are some factors that we need to consider when wondering what might happen at the SI joint. The largest factor would be how tight your hamstrings are. If the hamstrings are tight and the pelvis isn’t free, your lower back will be rounded. In this scenario, your SI joint is most likely to be nutated. Nutation occurs at the point where you have folded forward so far that you have reached the end of range of motion for flexion of the hip joint. At that point, the weight of the spine pulls the sacrum forward and down in relationship to the pelvis which is fixed on the floor (if we are talking about a seated forward bend). If your pelvis is free and your hamstrings are flexible and you are able to lengthen your spine, you will still have nutation happening. The potential pressures will be reduced in that case, because the sacrum and the pelvis are moving in the same direction. This is complicated, but the additional movement from the lower spine moving further into a lumbar curve will also move the sacrum into nutation. It seems the most amount of controversy happens if you ask questions about what happens to the SI joint during backbending postures. If you are standing and you arch your back and drop your pelvis down and forward, you are likely creating nutation in your spine. Often people will point out how gymnasts arch their back before they do some form of drop back to the floor. While they are doing this, their sacrum is in nutation. Often I have heard people extrapolate from this to say, then, that this must be the safest way to do backbends. I agree. In a standing position, if you arch your back, you will put your sacrum into nutation. However, I believe that it does not remain in that position when you are in a backbend. My sense is that as we hyperextend the hip joints, the dynamics at the SI joint change. In my mind, counter-nutation occurs at the point where you have reached the end of range of motion for extension of the hip joint. At that point, the weight of the spine pulls the sacrum back and down in relationship to the pelvis. Having said all of that, I am not 100% sure, and NO ONE IS. It’s never been tested in any kind of study that we can find. Is counter-nutation a bad thing? I think it’s a normal, natural movement. By itself, it may not be bad. If you have SI joint dysfunction or a hypermobile SI joint, it could certainly be more problematic. It does seem that nutation is a stronger position for the SI joint to be in. During twisting, it’s doubtful that nutation or counter-nutation happens at all. There are, however, shear forces that can be placed on the SI joint. I have seen this anecdotally many times with students who are going through bouts of SI joint dysfunction. Overloading the twist through the hips and spine can be painful! It’s important to note when talking about SI joint function in movements, that the sacroiliac joints do not function in isolation. If we are talking about a movement, such as twisting, the SI joints are functioning in relationship with pelvic movements happening at the hip joints as well as spinal movements. 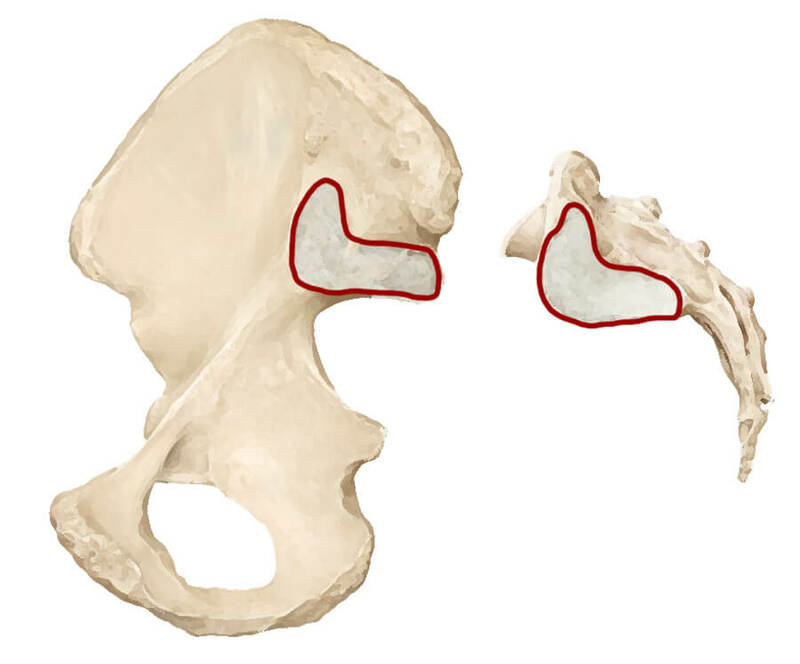 Another issue, when discussing the SI joint, is both distinguishing, as well as understanding, the relationship between movements at the hip joints/pelvis and the movements at the SI joint. There is overlap and relationship between these movements. The pelvis does what is referred to as an anterior tilt and a posterior tilt. Looking at the pelvis from the side, when the pubic bone moves down (at the hip joint), we refer to this as an anterior tilt. When the pubic bone goes up (at the hip joint), we refer to this as a posterior tilt. This movement happens primarily at the hip joints (where femur meets pelvis) but it is also associated with movements of the spine. The pelvis also does a drop or hike. When we look at the pelvis from the front or back if one side goes up, we call that hip hiking. When one side is dropping, we refer to that as a drop. Rotation is also a movement described at the pelvis. If you look at the pelvis from above, if one side is moving forward or going back, we would say that the pelvis is rotated. Any and all of these movements can have an impact on forces going through the SI joint. This is true particularly at the end of the range of motion of each of those movements (anterior or posterior tilt of the pelvis, hip hiking, hip drop, or pelvic rotation). These movements also naturally translate into the lumbar spine at the very least. Can you feel movement at the SI joints? Most people will not feel their SI joint move. You may feel pain that is associated with the SI joint itself, but not movement per se. The exception to this is typically people who are considered hypermobile. People who are hypermobile have a tendency toward more flexible connective tissues which includes ligaments around the SI joint. As a result of that, they may feel it slip, clunk, move, “go out of place”, or have other ways of describing it. Generally speaking, we don’t want to create movement at the SI joint. Why? If it moves out of place, there is a higher chance that you will end up with some sort of SI joint dysfunction. Within the medical community, if you have an SI joint that moves too much, they try to stabilize it. Should you try to direct movement from the SI joints? Generally speaking, NO! The last thing you want to do is destabilize your SI joint. That is different from putting it into a position that works for your body. But, if you don’t feel your SI joint moving, how do you know that you are putting it in the “right” position? Distinguishing movement at your SI joint from pelvic and spinal movements is tricky. The other aspect of this that requires mentioning is that there are no muscles that are directly connected to, or seemingly strong enough, to make the SI joint nutate or counter-nutate. That’s not to say that there aren’t muscles that can influence this joint, of course there are. But their role is much more to do with stabilizing the joint in a particular position. Because it is a “passive” joint, which means that it is strongly influenced by body position rather than a muscle moving it, the muscles that do influence it seem to work secondarily to the body position you are in. Perhaps the answer is to follow the body’s lead and don’t try to fix something that isn’t broken or wrong already. Your body knows what to do with your SI joint when you are in different positions. The problems typically only arise for people who have SI joints that are “loose” or more mobile than they should be. These people are more likely to feel pain at the SI joint when doing particular postures. Those people do need to stabilize their SI joint in appropriate ways at that moment. That is subtle work and control for most of us. That’s not a bad thing and that does seem to be one of the directions that yoga asana takes us. That is, into subtle and small movements and experiences of those movements. What I often see is students who have been told to tuck their tailbone as a means to adjust their own SI joint. What do they do most likely? Squeeze their glutes. That may or may not move their SI joint. It may or may not stabilize their SI joint enough. It’s also not particularly specific. If it works, great, there is NOTHING wrong with doing it, but one shouldn’t assume that it means that the SI joint is being moved in the way that they think it is. This is not to say that if the felt-sense experience helps, feels “right” or “good” that it isn’t real. It’s just not necessarily literally what is happening. What are the characteristics of SI joint pain and how do the characteristics help you determine where the pain might be coming from? Most people will describe SI joint dysfunction as a sharp pain close to the SI joint. They often point to, or very close to, the bump that you feel on the back of the pelvis. It’s usually a couple of inches off the center line and near the top of the pelvis. Having said that, it can be a dull ache, and radiating pain at times. The variety of descriptions can make it more difficult to pinpoint the cause. It could be postural, structural, muscular, or functional in nature. What it usually implies is that the actual joint itself is irritated. That could be because it is out of its perfect position. Is it out of position because of an accident or are muscles putting forces on it that pull it out or keep it out of place for a period of time? 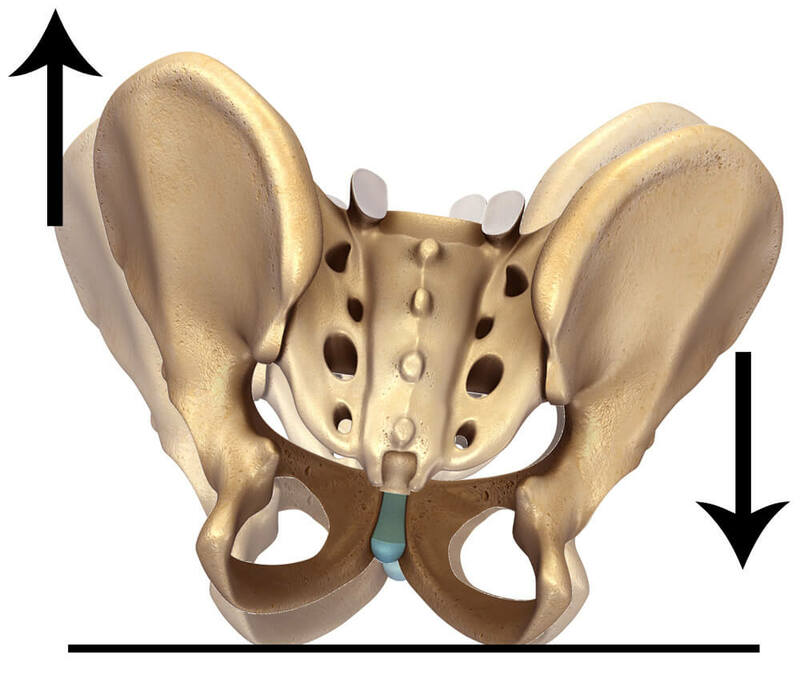 Is the pelvis out of balance on the right or left side and creating a force on the SI joint? There are many possibilities beyond that. My bias is to start with muscles. They are typically treatable and it’s not particularly invasive to work with or on them. It seems like a good starting place. The piriformis muscle crosses the SI joint and helps to maintain the position of the sacrum relative to the pelvis. We already mentioned piriformis as a stabilizer of the SI joint. Due to the piriformis attachment on the inside of the sacrum, it has the potential to pull the sacrum out of its ideal position relative to the pelvis and put pressure into the SI joint if it is tighter than it should be. If you’re also having pain in the buttocks or even down the back of your leg, it could be an indication of the piriformis being involved in the problem. The psoas also has the ability to alter the balance of the pelvis and how it sits around the spine. Any change in the relationship in space of the pelvis to the spine can impact what is felt at the SI joints. There are arguments that the piriformis and the psoas together can help or do stabilize the SI joint, muscularly speaking. If there are two muscles you are going to start working with to help re-establish balance at the SI joint, then these two are my choice. It doesn’t mean that it will solve everything, but it may help you identify whether the problem is at all muscular. Of course, there are other muscles that could impact the SI joint less directly. The Piriformis and Psoas Major Muscles Help Maintain Balance of Tension at the SI Joints. SI joint pain in yoga often comes from force being placed on the joint in extreme ranges of motion most commonly in forward bending, backbending and twisting. As I described, when we move to the end of range of motion for the pelvis at the hip joints, either forward or backward, force is put into the SI joints. Any imbalance between the sides of the pelvis, a softening of the sacral ligaments (from hormones at pregnancy or stage of menstrual cycle), as well as other factors, can contribute to irritation of the SI joints when they are receiving force. Irritation of the SI joints is often reported in twisting in particular. The lower section of the spine, the lumbar spine, is limited in its range of motion for twisting, due to the shape of the vertebrae in that section of the spine. When we hit the end of range of motion for twisting through our spine, force can then go into the SI joints and cause irritation. 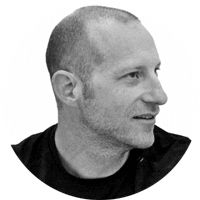 There two ways to approach what to do with your practice. You always have the option to back off or out of any posture that you believe is irritating your SI joint. What I typically do is take someone’s practice and look for ways to remove any shear forces that are going into their SI joints. Not putting the heel down in warrior 1 – especially in Sun Salutations. Notice How the Foot Placement in Warrior Can Affect the SI Joints. Making sure they are not overdoing pressure in the lower back during up dogs. Adjusting the pelvis in twists and allowing the pelvis to move more than normal. Notice How the Hip Placement in Revolved Triangle Affects the SI Joint Placement. Making sure that the hip flexors are open prior to doing any deep backbends, including urdhva dhanurasana. Either stabilizing or not going as deeply into forward bends, and temporarily removing deep forward bends such as kurmasana. If all of this helps alleviate the SI joint pain, then I would have the student work with their practice in this way for a couple of weeks. From there, slowly undo these modifications unless the pain starts to come back. There is always the possibility that trigger points are part of SI joint pain. Regardless of how they occur, there are a number of muscles that have trigger points that overlap with the area that people often point to when they have SI joint pain. 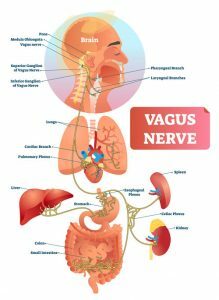 Here is the list and a link to a great resource (www.triggerpoints.net) with a full list and images of these muscles and how they refer into the area. You can see images of the common trigger points in these muscles that can refer pain around the SI joint here. The SI joint is unique among joints in the body. This makes it an interesting subject of discussion and also still a bit of a mystery. Researchers still don’t know exactly what the SI joint is doing when we move in different ways. Ultimately, what we do have is our own felt sense of what feels good, stable, or supportive in our own body. Anatomically, it’s interesting to muse about what might be happening at the SI joint. Kinesthetically, what’s important is that we move in a way that works for us and doesn’t destabilize joints or cause pain, regardless of what technically is or is not happening at the SI joint. Which of the following describe you? Vleeming, A., M.D. Schuenke, A.T. Masi, J.E. Carreiro, L. Danneels, F.H. Willard. 2012. The sacroiliac joint: an overview of its anatomy, function, and potential clinical implications. Journal of Anatomy. 221:537-567.